I belong to the latter group of people. I have already read and enjoyed The Hobbit and The Lord Of The Rings. 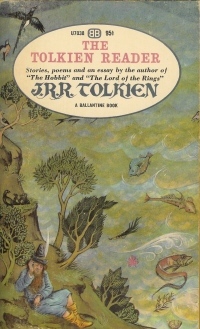 And, I loved reading the short stories and poems of Tolkien in this book. There were three stories- Tree and Leaf, Farmer Giles Of Ham and The Adventures Of Tom Bombadil. Since, I have already been introduced to Tom Bombadil in the Lord Of The Rings, I already knew who he was. I love Tom Bombadil’s cheerful songs. I also liked Farmer Giles Of Ham. It was very different, and had a completely different set of characters. The Tolkien Reader also contained a play written by Tolkien-The Homecoming Of Beorhtnoth Beorhthelm’s Son. That was very nice, too. 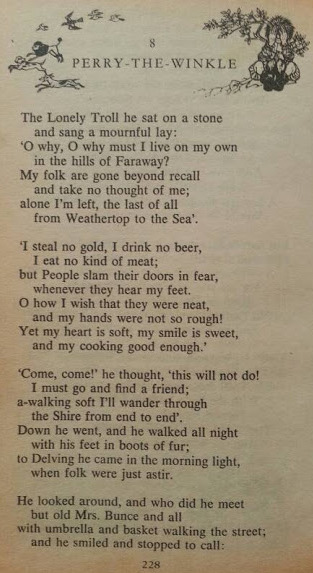 In the end, the book had a random collection of poems by Tolkien from the Red Book. All the poems and songs were very nice. I have always loved J. R. R. Tolkien’s songs! But my most favourite was Oliphaunt and Perry-the-Winkle. I loved reading the book. It really was an indispensable addition to my small shelf of Tolkien books! Do read it.